I made it for my husband. 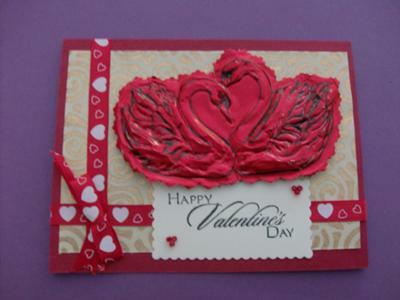 I stamped the swans on the red foil and turned them over and embossed them. I cut them out using the Fiskars decorative scissors. I adhered the gold patterned paper to the red card stock then adhered the ribbon and secured the bow with a glue dot. I used hot glue to adhere the swans. Then I stamped the Valentine sentiment and cut it out with the Spellbinders die. Used 3 seed beads for the hearts and glued them onto the sentiment which I then put on the card. I am married, have one daughter we adopted from China. I have been making cards for about 15 years and love to try new techniques. You can see more of my work on my blog, Juliana's Papercrafts. 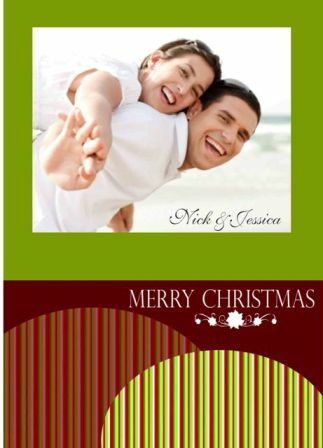 I also earned an honorable mention from Homearts Club magazine for a card I made for my sister.